Fitness For The Rest of Us: GIVEAWAY: Bios Pedometer Review & Giveaway Courtesy of 13Deals.Com! 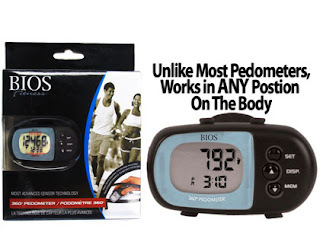 GIVEAWAY: Bios Pedometer Review & Giveaway Courtesy of 13Deals.Com! Have you been to 13Deals.com lately? Every day they off 13 fabulous items at deeply discounted prices! Their products range from health & fitness items, household products, children's goods, clothing, electronics, outdoor & camping items, and MORE! Deals change as items sell- so if you see something you like -grab it! Many items come with free shipping, and some offer super cheap shipping (like $2.99). And the more you buy- the cheaper your shipping gets! DH & I check out 13Deals DAILY because we never know what we will find! Keep reading to find out how you can win your very own Bios Pedometer courtesy of 13Deals (MSRV $54.99 but ONLY $15.99 on 13Deals!). This pedometer works very well and is really accurate even during my workouts. What I really love about it is that you can put it anywhere- on your shoe, in your pocket, in your purse, clipped on your waistband, around your neck- ANYWHERE and it still accurately registers your steps. Its offers a sleek look and is very compact. It comes with an instruction booklet, battery, clip, and strap! This is a great alternative to spendy & often inaccurate heart rate monitors- you can gauge which dvds or workouts provide you with more steps. Its really a great easy way to gauge your movement throughout your day and push yourself further the next day! Mandatory Entry: Head on over to 13Deals.com and tell me something you learned along with your email address. And remember two entries = two comments so leave separate comments for each entry. For example- you would leave 5 separate comments for reblogging this. And DONT FORGET YOUR EMAIL ADDRESS in your 1st comment. Entries will be accepted until 11:59 pm on 4/1 and the winner will be selected using random.org random number generator and announced on 4/3. Contest open to contiguous US and not an APO address (PO Boxes are fine). really could have used that smoke deodorizer yesterday when my new oil burner was first ignited!! I entered the Xtend Barre contest. I entered the Supreme 90 giveaway. I entered the Cardio Pump Fusion giveaway. I entered the Tracie Long giveaway. I would get a pet pillow! I entered the Cardio Pump Fusion giveaway. sariade at yahoo dot com. I learned that the system employs muscle confusion for optimal weight loss. I learned they have a lot of deals at a time, and they change throughout the day! I like FFtRoU on FB! I'd really like the Pedometer! I voted in the poll! I learned the pedometer is sold out. Awesome site! I love that they have a Pet's deal too! OMG so cool! I saw on 13 deals that they make one with an alarm, how perfect for females to feel safer out on the roads. Thank you for all your efforts this is really neat! I'm running for the first time, when I started I sadly couldnt even do 1/4 of a mile, loved working out, hated cardio. So with Warrior Dash coming soon I've been sharing my times and I'm up to 4 miles, the app on my phone is good but sometimes messes up and isnt accurate! This pedometer works in any position...that is awesome! 13Deals prices are great! Now get out there and exercise everyone!!! I learned that right now they have a sale on 2 glow in the dark flashlights for $6. Pretty neat :). I like 13deals on facebook! I like fitness for the rest of us on facebook! I learned that "Once we sell out, we sell out." I would get 2 Pack - 9 LED Glow in the Dark Flashlight. I entered the Xtend Barre giveaway. I've never heard of 13deals! Neat! They offer thirteen (sometimes MORE) deals a day- but never any less, and they last just for that day. I follow 13deals on twitter! I'd get the electric bug zapper racket from their deals today! I learned that the deals change all day. I like the Immerson Hand Blender. I follow 13Deals on Twitter. I learned I shouldn't go there! Too many deals. And some funny ones; just add water underpants!? Awesome. Do they stand up to children's accidents? They have glow in the dark flashlights! Thanks for the great giveaway!